Garden Sparkle Blog: To market to market.... on International Fairy Day! To market to market.... on International Fairy Day! Today is 'International Fairy Day' .... to celebrate in style Garden Sparkle is having its first ever market stall at the TANKS ~ Body, Mind and Soul Festival in Cairns. Please flutter on over to say hi! We have plenty of magic fairy dust to share around :O) We are also running a free raffle to win a magical fairy door! 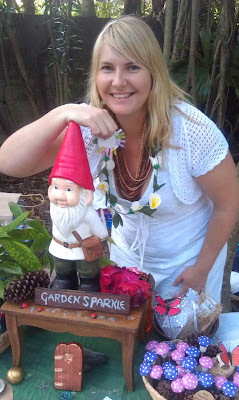 Here is a pic of me with my friend Harold the Gnome. The fairies are blogging at last!